When you think of Florence, Italy you probably think of art, culture, and architecture, or the "birthplace" of the Renaissance. You probably don't think of pharmacies. But, the history of pharmacy in Florence is a long and important one. One of the best parts about this history is that it still thrives today. 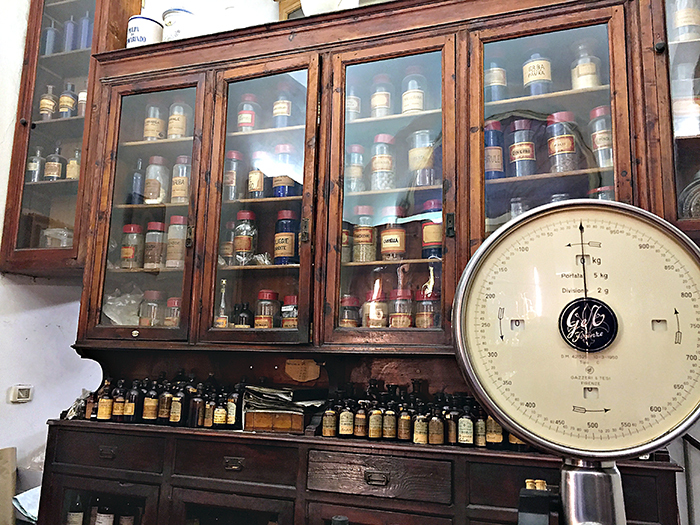 There are many antique pharmacies you can visit throughout the city that still sell historic therapeutics and perfumes (perfumes were medicines before they were cosmetics). Here are a few of my favorites. 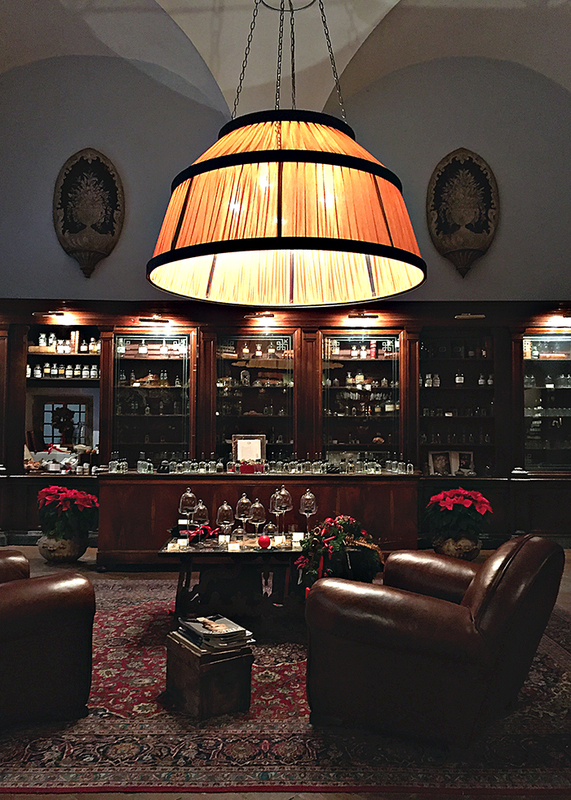 This is the oldest pharmacy in Florence. It has been in operation for almost 800 years! The pharmacy began as part of the Dominican religious compound on which it still sits, Santa Maria Novella, in the early 13th century. Friars cultivated herbs and made therapuetics (oils, balms, and herbal remedies) for the health of their convent and community. For example, when the Black Death struck Florence in the mid-fourteenth century, killing more than half of Florence's population, the friars started producing rose water. This rose water, or Acqua di Rose, was a natural antiseptic and was used to clean the homes of the dead. 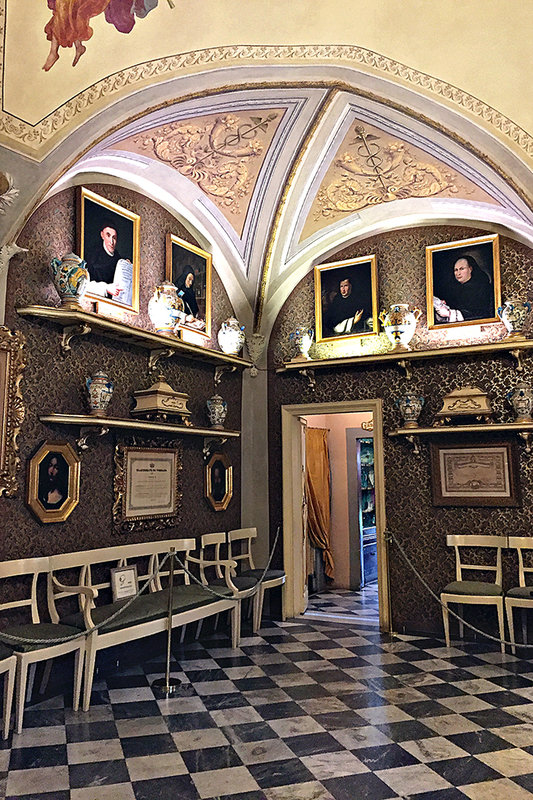 By the 16th century the pharmacy was opened to the public and also served the medicinal needs of the Medici Grand Dukes and Duchesses (the rulers of Florence). One of the pharmacy's most famous patrons was Catherine de' Medici, a Medici princess and future queen of France. For the occasion of Catherine's marriage to the Dauphin of France, Henry II, the friars created a special perfume for Catherine. They called it Acqua Della Regina (Water of the Queen, although today it has been renamed Acqua di Santa Maria Novella). Today, the pharmacy (now independently owned and operated and called a perfumery) still makes these ancient concoctions. You can purchase your own rose water or smell like a queen of France. Pretty cool, right? "What's that perfume you are wearing?" Even if you aren't into ancient smells and cures, the interior of the pharmacy is worth visiting. It still retains its old-world charm and elegance. Now, the historian in me must mention something. The present-day pharmacy claims in their history that they were the official pharmacy of the Grand Dukes. While this makes a great story for tourists, I have to point out that my own archive research does not support this claim. While the Grand Dukes and Duchesses certainly did purchase goods and therapuetics from the pharmacy of Santa Maria Novella, they also maintained their own court pharmacy. 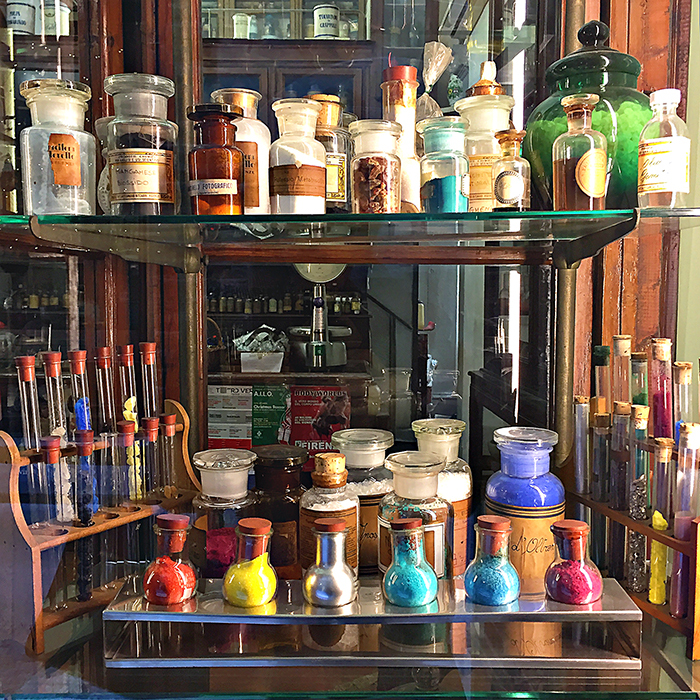 No other antique pharmacy in Florence can compete with the history of Santa Maria Novella, but there are plenty with just as many interesting things to offer. Acquaflor is one of those. 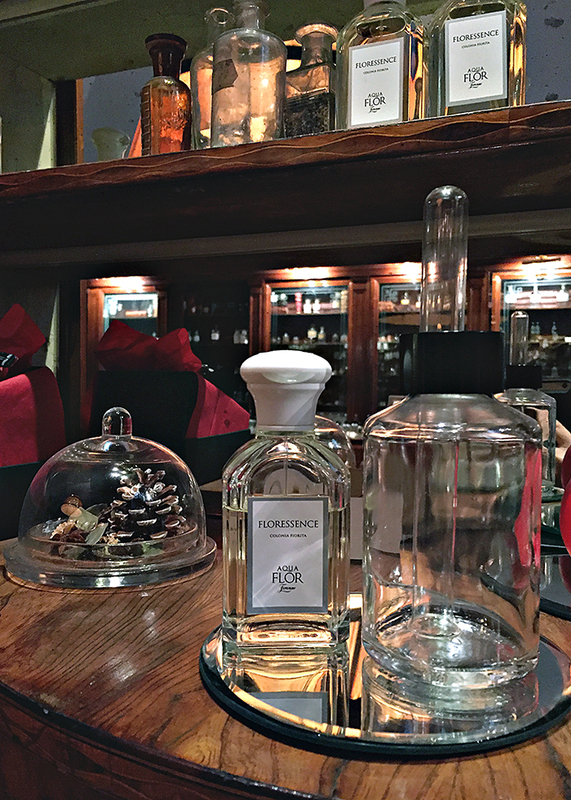 Opened a couple years ago, Acquaflor specializes in handcrafted fragrances, some based on ancient recipes and some with a modern spin. My favorite part of Acquaflor is the decor. 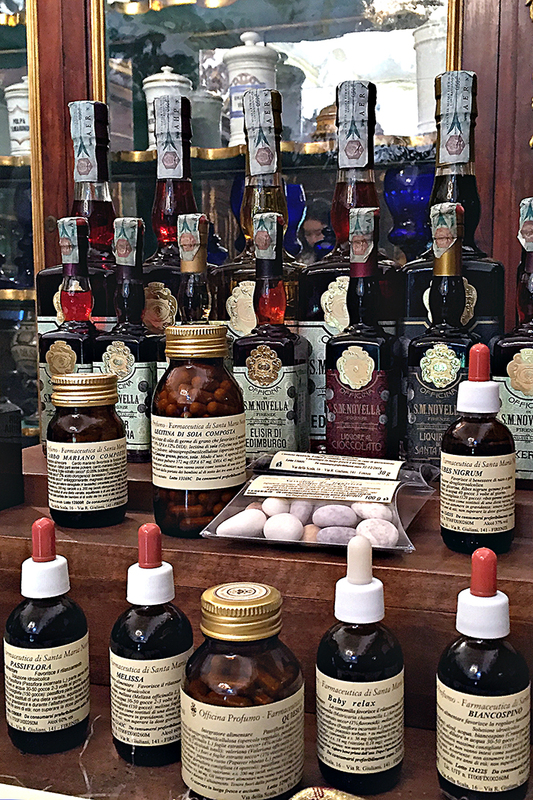 Everything is displayed in antique pharmacy cases and counters from the 18th century (most from Florence). As the name implies, Bizzari is bizarre! 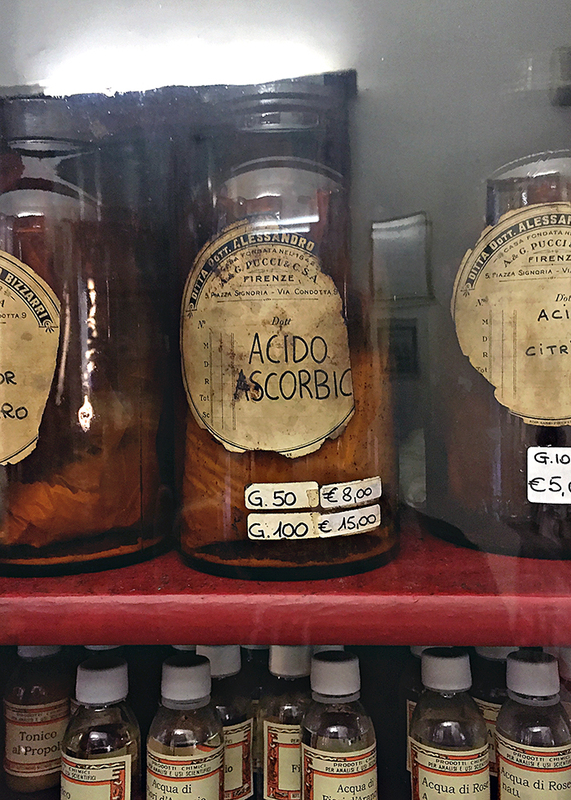 Founded in 1842, Alessandro Bizzari's apothecary shop sold everything from essential oils and tinctures, to exotic spices and bizarre and mysterious objects. Today, the shop retains its eclectic and curious appeal. 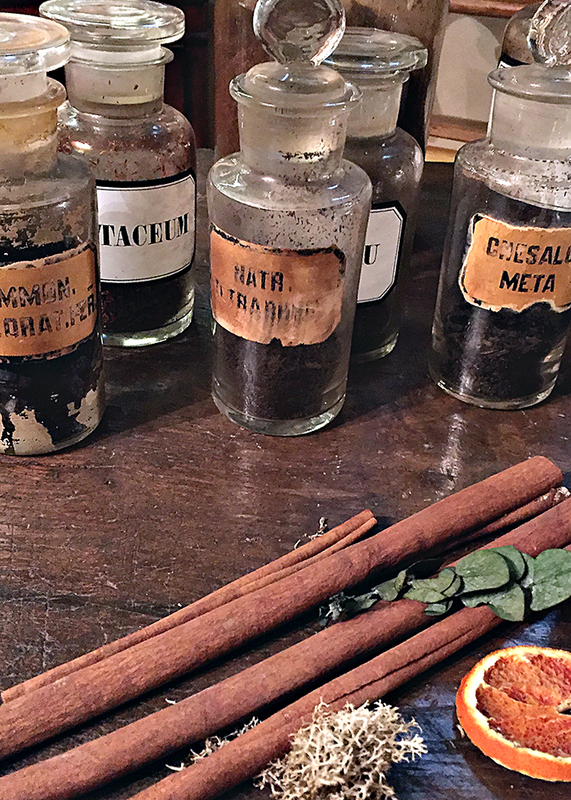 Inside you will find over-stuffed counters and cabinets crammed with all manner of jars, flasks, and bottles containing tinctures, oils, pigments, herbs and spices. You will also find an amazing collection on antique jars, flasks, and scientific equipment. 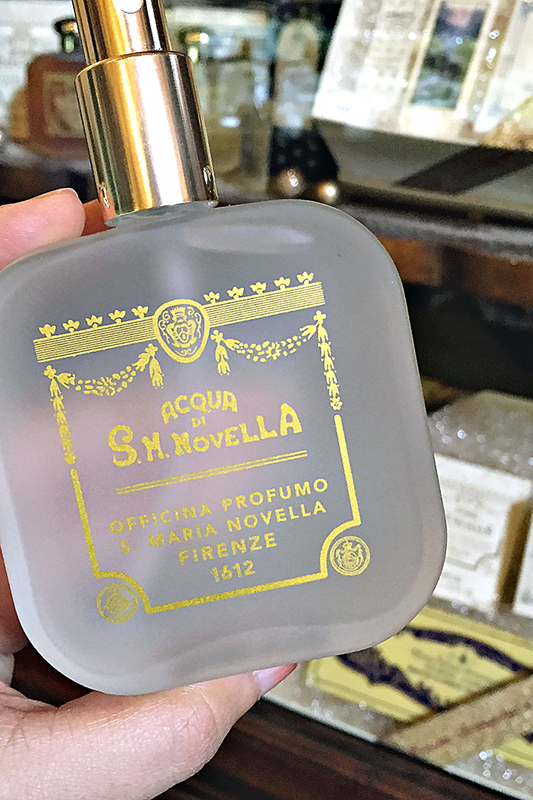 So if you're planning a trip to Florence, I highly recommend visiting a historic pharmacy and maybe treating yourself to a new (that's actually very old) perfume.